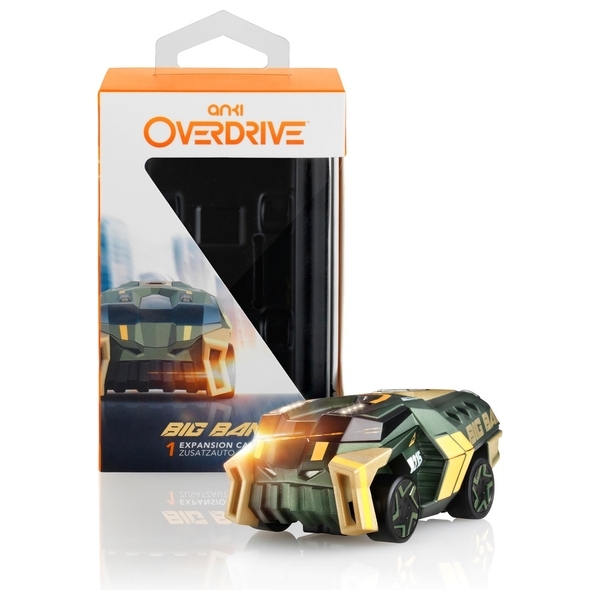 The Anki OVERDRIVE Supercar Big Bang is an armor-plated heavyweight whose Graviton Core can create massive shockwaves that send enemies flying off course. DRIVE THE FUTURE! What makes Anki Overdrive the world's most intelligent battle racing system? Tech so advanced, it feels like the future. Each Supercar is a self-aware robot, driven by powerful artificial intelligence (A.I.) and equipped with deadly strategy. Whatever track you build, they'll learn it. Wherever you drive, they'll hunt you down. The better you play, the better they become. Whether you battle A.I. opponents or friends, your tactical options are unlimited. And with continuous software updates, the gameplay always stays fresh. Customize weapons. Swap out cars. Build new tracks. It’s easy to pick up, and nearly impossible to put down. The future of play has arrived! MAGIC MADE BY SCIENCE! These aren't just cars. They're robots programmed for battle. Control them with your smart device and take down opponents with anrray of weapons, from plasma cannons to flame throwers. Its pulse-pounding play, made possible through state-of-the-art tech and it's an experience unlike anything else. SUPERIOR TECH! Each Supercar is loaded with cutting-edge features, including an optical sensor, a dedicated 50MHz CPU, and two high performance motors, for precision manoeuvring with 1 millimetre accuracy.